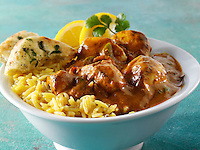 Vindaloo is a popular dish in many parts of India but originates from Goa. Vindaloo is a variation of the Portuguese dish "carne de vinha d'alhos," a dish of meat, usually pork marinated in wine and garlic. 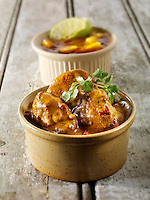 The Portuguese in Goa substituted palm vinegar fro the wine and added Kashmiri chillies. 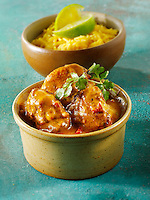 The Vindaloo we know today is an Anglo-Indian variation of the Portuguese original and is often a fiery spicy curry. As most Indian Chefs are Muslim, pork is not an option in Restaurants and the meat used is usually chicken or lamb. 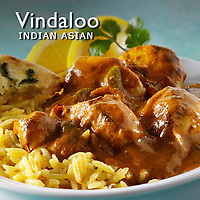 Restaurant Vindaloo is often a hotter version of Madras and the aloo part of the name, meaning potato in Indian, has seen the introduction of potatoes into the dish. Traditionally though Vindaloos do not contain potato. The meat is marinated in vinegar, sugar, fresh ginger and spices to creature a sweet and sour dish.